The boys are on their last week of break, but that doesn’t stop them from bringing you a bit of season 5 news! There are 3 big announcements to kick off season 5 news, and the first is revealed on this mini-sode. Find out what David and Dave can finally announce, and what else they tease at! 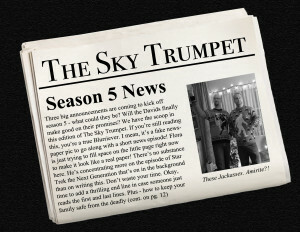 Season 5 will be huge, and lots of ideas will be coming to fruition. There’s even a short sketch from an old friend to start out the mini-sode. Don’t forget that Blurry Photos will be back to regular episodes next week, launching the next season with the annual Irish drinking episode. Hang in there, it’ll be back before you know it!